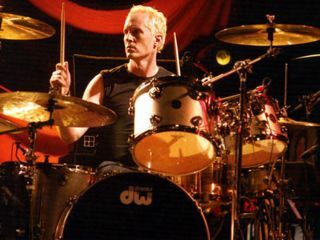 Josh Freese is one of the most in-demand drummers around. With a resume that boasts names like Nine Inch Nails, Guns N' Roses, A Perfect Circle, Devo, Sting and hundreds more, he's worked with the biggest and best. On the day of our conversation, however, he's just hanging...with a 19-year-old fan. The two just finished playing mini-golf after visiting the Queen Mary. Later, Freese is thinking of taking the teenager to Slash's place - once he lets him raid his closet, of course. OK, so what is Josh Freese doing letting a 19-year-old rummage through his personal belongings? Turns out it's all part of a unique (and highly successful) marketing plan behind his wonderful new solo record Since 1972. "I thought, OK, I could let the music to do the talking," says Freese. "Or I could do something fun and weird. So I came up with all these crazy ideas." Those ideas range in price from $7 for a copy of Freese's CD all the way up to a super-deluxe package of $75,000, for which the powerhouse drummer will join your band for a month. Not only that, but he'll give you one of his drumsets, party with you and record an EP about your life story. If you don't have a band but have $75,000, hey, no problem - Josh will be your personal assistant for a month. So far, this package is still up for grabs (shocking! ), but the $250 lunches at PF Chang's and The Cheesecake Factory are long gone. "People like lunch," Freese deadpans. With your new album Since 1972, you're not just a musician, you're a dealmaker. [laughs] "Yeah, I'm a dealmaker! Problem is, it's taking up all my time. This whole thing started out as kind of a joke, but now I have to make good on these offers, and it really cuts into my time." "And I started thinking, I should just call up these people and thank them for buying my record. Then I thought, What if I took them to the mall or to lunch? The idea developed into these nutty package deals, some of which are cheap and some are ridiculously - and purposely - expensive. But that's the whole fun of it. Who will buy these things. What kind of fans do I have?" I understand you've been hanging out with a 19-year-old fan? "That's right. I was on the Queen Mary with this kid from Florida who bought the $20,000 package. Can you believe that?" He must have rich parents. "I think he blew his inheritance or something. He flew in from Florida, and I've been hanging out with him. He was only supposed to get one day, but we're stretching it out into a couple of days. He's coming over my house in a little bit and I'll let him go through my closet. I'll give him this really great snare that I used on the last Nine Inch Nails tour." "Totally. I took him to meet [Devo's] Mark Mothersbaugh, and earlier today, Maynard from Tool was nice enough to come and play miniature golf with us. I was a little nervous about that, but it turned out to be a lot of fun. Then we'll hang out and do some other things. [pauses] I have to play on Slash's album later today…maybe I'll take him to that." "There you go. I have to make it worth his money. Still, I can see where this is going to cause some problems. This guy from Vancouver bought a package and I'm supposed to play drums on one of his tracks, but my girlfriend reminded me, 'Uh, that's the same day you're supposed to go to the Cheesecake Factory with this other guy...' I've got issues." Has anybody bought your Volvo wagon yet? That's only going for $10,000. "No, they haven't. And I'm a little surprised by that. I'm patient, though...and hopeful." Beyond fulfilling all of these crazy offers, you're still quite busy musically. You're a member of A Perfect Circle, Devo, The Vandals, you have a solo album - how do you manage it all? "There's times where it all runs pretty smoothly, and other times it's totally out of control. The Vandals aren't a full-time job; we play gigs here and there. It's more of a labor of love that I do for fun. A lot of times there's fill-in drummers that can take my place. "You know, if I get a call to do a festival with Devo or a one-off with Sting and he's paying me really well, hey, I have to tell them, 'Look, I'd love to do it, but I can't say no to these situations.' You know what I mean? And they're cool with that. "Devo's sort of the same thing as The Vandals. There's times where the band is really busy, but a lot of the time there's big gaps in-between. I just try to hope that the gigs don't land on top of one another." What's going on with A Perfect Circle? "Perfect Circle is on a hiatus right now. There's no plans right now; it's kind of a 'whatever happens happens' vibe. At the same time, we could get back together real soon." [Sighs] "That was tough. I toured with them for three years and it was awesome. But I just had my third child and it became important for me to be home more. I bowed our gracefully. It had nothing to do with Trent, but I had to tell him, 'Look, this is where I am. I love you, I love the band, but I have to make a life decision.' I mean, we toured a lot!" Speaking of bands that don't tour a lot, you were briefly a member of Guns N' Roses. "I spent two years in the studio with Axl, from '98 to '99, and when it became apparent to me that they weren't going to leave the studio, that's when I had to go. The whole time I was with Axl I never played a show with him. "We were in our own little bubble. For a time, we were in the studio five nights a week for 12 hours at a time. Then it became a time where we weren't so busy. It was an interesting period for me." On a related Guns N' Roses note, you're recording with Slash. How's that going? "It's awesome. He's making kind of a Santana record with a bunch of different singers. There's an Ozzy track, an Iggy Pop track, a Fergie track…Chris Cornell's going to be on it. As of now, I'm the only drummer on it, but you never know..."
Let's talk about your own album, Since 1972, which is wonderful - it's a pop record! "Thank you. You know, I love pop music. I'm all over the place. I like pretty stuff, I like hard stuff, I like sad stuff and I like super-punk stuff. I tried to put it all on this record." I have to ask you about the song called I Wanna Cheat On My Girlfriend. [laughs] "Yeah, well...that's the only 'funny' song on the record. I actually cleared it with my girlfriend before I wrote it - had to make sure she was cool with it, you know?" Who Am I To Say, Really? is a gorgeous ballad. "Wow, thanks. I'm glad you like it. That's a very personal song for me...almost too personal, really. It's funny though: I played that song for a friend who's totally into straight-up punk, and he loved it! I guess pretty is pretty." "To Glen Campbell! I just played with him too. That was a blast. As far as my style goes, it's all under the 'pop music' umbrella. Verse-chorus-verse-chorus. I'm not playing be-bop jazz or anything. "I'm just a fan of rock and pop music, and I think I bring an enthusiasm to what I do. I don't try to change the basic way I play with any particular artist. For instance, with Sting, I didn't do a traditional grip like Stewart Copeland. I figure, Sting is hiring me because he likes what I do, you know?" Do you change your kit around a lot? "Not really. I might change a drum here and there, but nothing too radical. For the most part, I stick to a basic five-piece rock 'n' roll setup. I don't get crazy like other drummers: 'Somebody changed the height of my seat, I can't play!' [laughs] A drummer should be able to sit down at a kit and make it happen." You've played with so many people. But has there ever been a gig you really wanted that you didn't get? "Yep. In '93 or '94 I got flown up to Seattle to audition for Pearl Jam. You gotta remember, they were the biggest band in the planet at the time - and they're still amazing. I played with them and it was great. Stone Gossard wanted to pick me, but for whatever reason, it didn't happen. I guess I wasn't meant to be part of their 'family,' you know? But they're really cool guys, and I've stayed friends with Stone ever since. All things for a reason." The free MusicRadar newsletter serves up the week's biggest and best artist and product news stories alongside exclusive tuition and grear reviews. Sign up here! Get instant access and bonus content plus chat with the team. Start here!